Johannesburg – If planned new legislation goes through Parliament, South Africans who work overseas could be taxed locally for foreign earnings from March 1 2019. This comes as National Treasury plans to repeal a tax exemption on income earned by South Africans working overseas. Treasury issued two draft bills for public comment on Wednesday. The bills, the 2017 Taxation Laws Amendment Bill and the 2017 Draft Tax Administration Laws Amendment Bill, give effect to tax proposals announced on February 22 by former finance minister Pravin Gordhan at the 2017 National Budget, explained Yanga Mputa, chief director legal tax design. The bills deal with “complex” and “administrative” matters and do not include matters of the draft rates bill. The public has until August 18 2017 to comment on the bills, before Treasury and the South African Revenue Service (SARS) introduce them to Parliament. Proposals of the Taxation Laws Amendment Bill include the removal of the foreign employment income tax exemption for South African citizens. Mputa explained to Fin24 that the exemption was introduced to prevent double taxation of South African residents working outside the country for more than 183 days. But upon investigation, government realised that the non-taxation was doubly applied, by both South Africa and the foreign countries of work, she explained. “This exemption was never intended to create situations where employment income is neither taxed in South Africa nor in the foreign host country,” the bill read. The exemption is also unequal in its treatment of South African residents employed by government and those employed in the private sector. Government employees do not qualify for this exemption in respect of foreign employment income, and private sector employees do, the bill explained. South African tax residents will now be subject to tax on foreign employment income earned in respect of services rendered outside South Africa but may receive relief for foreign taxes as a rebate, according to the bill. This will come into effect on March 1 2019. Tertius Troost, tax consultant at Mazars, said this “contentious” issue will impact South Africans’ decisions to work overseas to raise funds, as well as employees who may be seconded overseas for six-month periods. “This proposed amendment will most definitely negatively affect South African tax resident employees working in low tax or tax-free jurisdictions,” he said. Troost said that a lot of public reaction is expected during the commenting period. Jerry Botha, managing partner of Tax Consulting South Africa, explained how South African residents working overseas will have to pay tax. 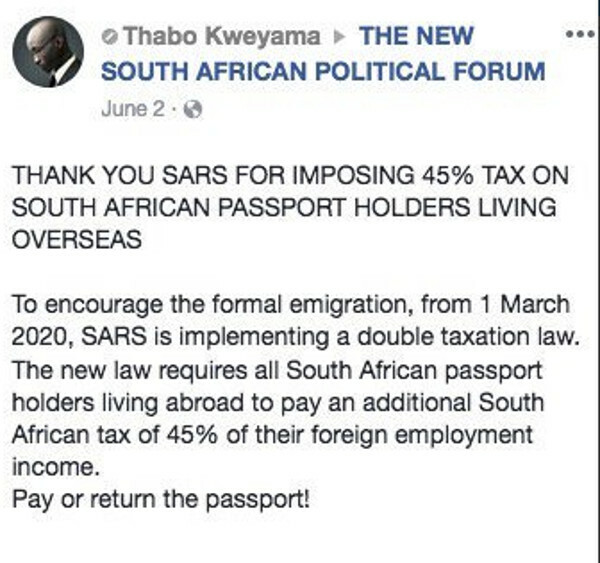 For example if they fall within the 45% personal income tax bracket, and if they pay 25% tax in the foreign country, they will have to pay the 20% difference to SARS. There are limited options for South Africans abroad, should this law take effect, said Botha. “One alternative would be to properly emigrate, in which case there is a deemed disposal capital gains tax event.” Botha said that SARS probably expects this move and has incorporated a special disclosure on tax returns for the 2016/17 year. South Africans could also establish a tax treaty residency in the foreign country, but this may be complex, he said. “We have seen some expatriates indicating that with full tax on international employment income, which is what is effectively proposed, coupled with the high costs of international work, coming home may be their only alternative,” he added.